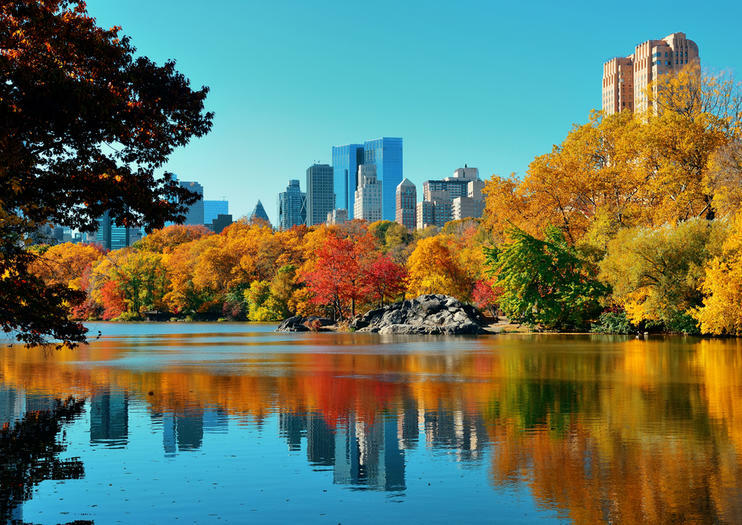 With the summer tourist crush a thing of the past and Halloween and Thanksgiving celebrations on the horizon, fall is a fantastic time for travelers to explore the Big Apple. See below for how to make the most out of a fall trip to New York City. Enjoy bird’s-eye views of the NYC skyline and Central Park foliage on a helicopter ride. Get into the spooky spirit of Halloween with a ghost tour of Greenwich Village or a scary Broadway musical. Embark on a leaf-peeping river cruise. See the giant balloons, floats, and marching bands of the Macy’s Thanksgiving Day Parade. Take in the dazzling city views from the sky-high observation decks of the Empire State Building or One World Trade Center. Alternate between fresh-air activities, such as a bike ride, and indoor attractions, such as the Metropolitan Museum of Art, with an NYC sightseeing and activity pass. Forget trying to snag a hard-to-get reservation at New York's hottest restaurants du jour. Instead, indulge in a delicious three-course dinner during the cruise on an all-glass boat around New York City that offers you an up-close look at the Statue of Liberty and other famed sites. As a live pianist plays relaxing music for you, take in the immense view of one of the world's great cities and enjoy a delicious pre-set dinner by the on-board executive chef. Upgrade to enjoy a romantic or first class VIP experience including a private table and French sparkling wine! Watch the Macy's Thanksgiving Day Parade from a prime vantage point during this experience in Manhattan. From an indoor viewing area on the 4th floor of a building along the 6th Avenue parade route, you can watch the balloons go by at eye level, plus enjoy a bagel breakfast—an NYC tradition. When booking, you have the option to include a dinner cruise on Thanksgiving evening. Discover the untold story of Oz with the smash hit musical ‘Wicked’ on Broadway! Winner of more than 100 international awards, including three Tony awards and a Grammy, ‘Wicked’ continues to delight audiences with its imaginative story and unforgettable score. Join millions of fans who have peeked behind the emerald curtain to discover the back story of the Wicked Witch of the West. Choose from a matinee or evening performance at the Gershwin Theater. Greenwich Village is one of New York City’s most beautiful and famous neighborhoods. It’s also one of its most haunted. Take a spooky stroll through ‘the village’ on this guided, 2-hour walking ghost tour. Visit Washington Square Park, the Big Apple’s most haunted park, and see the infamous ‘Hanging Tree.’ Check out the Brown Building on the campus of New York University, plus 14 West 10th Street, the most haunted house in Manhattan and more. Hear chilling stories of celebrity ghosts, lost children, phantoms and much more. Wake up with the City that Never Sleeps on a trip to the Observation Deck of the Empire State Building at sunrise, before the building is open to the public. Jumpstart your day with 360-degree panoramic views of the sunrise illuminating New York City below on an experience limited to 100 people. Enjoy a fall day in New York with a 2.75-hour brunch cruise along the Hudson River. Aboard a 1920s-style yacht, you'll travel northbound from the city, passing by the Palisades as you feast on a brunch buffet. One Bloody Mary, mimosa, beer, glass of wine, soda, or juice is included; other drinks may be purchased.